As the first Ninja anywhere in the world to achieve a major race win upon the launch of the now iconic sports bike brand in 1984, the machine has become part of Kawasaki’s worldwide racing heritage and features in the company's Ninja 30 celebrations. Featuring as part of the Wilson & Collins presentation of historic machinery as part of the Classic TT festival presented by Bennetts, the Ninja has been owned and in the care of the same person since new and will be ridden by him on the parade lap. Owner of GT Motorcycles, one of Kawasaki’s longest standing dealerships, Mike Grainger sponsored the bike and its rider, Geoff Johnson, in the 1984 race and has cosseted the machine ever since, the bike being on permanent display in his Exeter showroom until being transported to the Isle of Man by Wilson & Collins Racing. “It’s more than a dream, it’s a once in a lifetime experience”, said Grainger. “Geoff was not simply a sponsored rider but a very close friend; I will be riding the bike not just to evoke memories a like-minded soul who has now sadly passed away but of an historic win that was became a cornerstone of the Ninja legend". 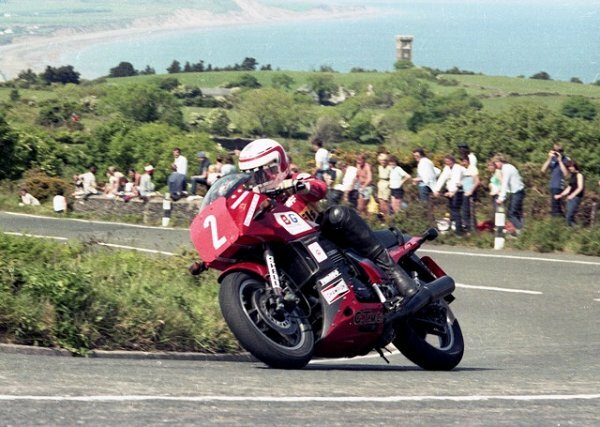 Geoff Johnson riding the Kawasaki Ninja in the 1984 Production TT. Only for use to illustrate this story.